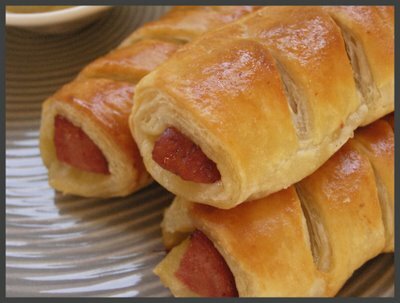 For a party at your backyard or for hanging out for a family picnic, pigs in a blanket can be a real treat for people of all ages. These sausage foods are normally served as appetizer but their delicious taste can make you eat a whole of them to vanquish your hunger. Any preferred dipping sauce, especially aioli dipping sauce, can really add up charm to the taste of pigs in blankets. You can simply prepare them a bit ahead of party time and them pop them in your microwave to serve the guests. Put the flour, baking soda, baking powder, salt and wheat gram in a large mixing bowl and beat all the ingredients very well. Add the vegetable shortening to the ingredients of the bowl and use a pastry cutter to whip the mixture vigorously. You should see pea-sized chunks once the ingredients are thoroughly mixed. Add buttermilk and egg yolk in another smaller mixing bowl and whisk them together to make a frothy mixture. Pour the buttermilk and egg yolk mixture on the dry ingredients and stir them well to form a moist dough. Start kneading the dough and when finished properly, let it settle for about 20 minutes. You will notice that the dough has swollen to double its size within 20 minutes. You can further speed up this process by placing a clean moist towel on the dough. When the dough is ready, start dividing it into 10 equal portions. Roll each portion of the dough into long and flat rectangular pieces. Place sausage at the center of the dough piece and carve 5 small cuts on both sides of it in the dough. You need to make a braided look on the dough and your cuts have to be crossing side over one another. It’s time to bake the pigs in blanket. Don’t forget to grease the baking paper with cooking oil or butter before placing the dough on it or otherwise the paper will stick to it after the baking process. Cover the pigs with a clean towel. Preheat the oven to 350 degrees Fahrenheit and bake for 15-20 minutes until they get golden brown.